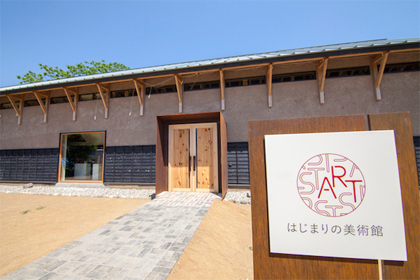 Report about the Hajimari Art Center : New Day – There will always be a new tomorrow. There will always be a new dawn. A New Day. After more than a year of preparation, we are happy to announce that the Hajimari Art Center has officially opened its doors. Our staff were on hand for the opening ceremony and below is a report filed from the festivities. 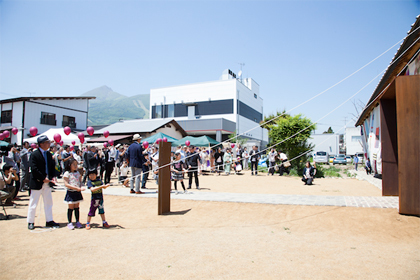 On May 31st, the day before the official June 1st opening, a pre-opening barbecue party was held on the museum grounds. bringing with them meat and the local specialty, asparagus. The good time had by all is well evident from the photos below. Here we see a performance by HANA, a latin percussion group composed of friends of at the Asakaaiikuen Social Welfare Center. Inside the museum, a cooking event was held bringing together knowledge from the various workshops held previously. Seeing such a wide variety of people of all ages come together to take on a common task, one truly felt the fruition of the the groundwork laid by the museum over the past year. During the viewing portion of the event, there was much praise to be heard for the exhibition on display, “Tezukuri Hon Shikomi Geijutsu”. For more information on the exhibition, visit the link below. And then finally, the big day was here. We’re happy to note the museum was blessed with astonishingly good weather. Over 200 people attended the opening and there were good vibes all around. Our own Takumi Kaseno, Chairman of the GEISAI Executive Committee was a participant in the commemoration ceremony. It’s worth remembering that the New Day project began when we were forced to cancel GEISAI#15 in the aftermath of the disasters and started a site where messages and images could be gathered in one place. Thus, the relationship with GEISAI is actually quite strong. All of the various speeches dealt with the strong desire to see the museum become a real force for good in the community. And as part of the opening, we had a truly unique installation that fits perfectly with the museum’s mission. Quilts gathered from locals all around the area were put together in a massive handmade patchwork. With the crowd counting down, the ropes were pulled. A shot of the completed and commemorated museum. 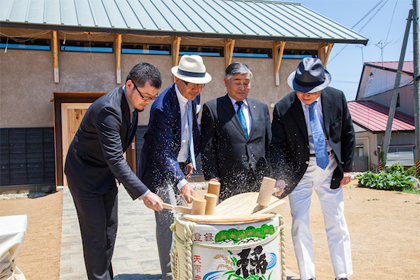 With commemoration complete, it was time for the Kagamiwari sake ceremony. There was enough enthusiasm to send droplets flying through the air. The sake used was a local brand Inagawa. 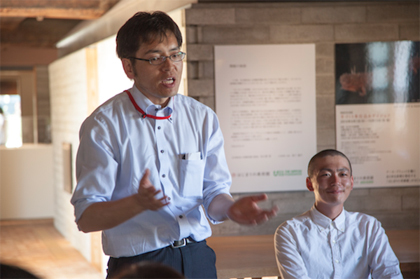 In the afternoon, we were treated to live talks by the museum’s organizers. 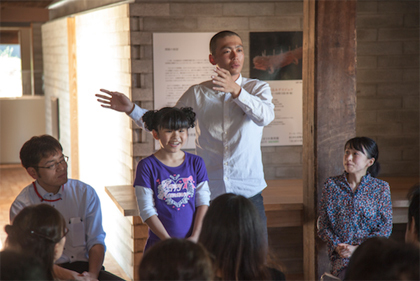 Museum Director Takayoshi Okabe explained how his initial goal was to build a museum that would contribute to the community and how he has pursued that goal through the organization of workshops and opportunities for interaction with locals. Though the above represents the goals for the completed museum itself, the interactive events held in advance have proved so successful, that the space is already a favorite gathering spot for elderly and elementary school students. The young girl seen here is a 3rd grade elementary school student who has been coming to events regularly – the museum’s first and number one fan. 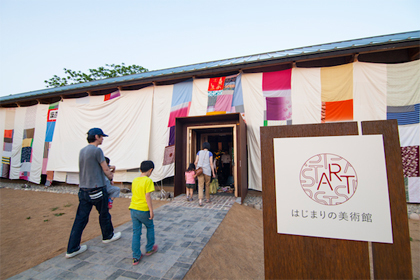 The Hajimari Art Center is already planning new events and exhibitions so we hope everyone will keep an eye out. The remaining proceeds from the New Day fund will also continue to be used to create community organizations for residents in the areas recovering from the disasters.